Size of Male: 130-180 lbs, 30-35 in. Size of Female: 100-150 lbs, 32-37 in. The Great Dane is as kind as it is large. While its large size can be menacing in appearance, this giant dog breed is a gentle, loyal companion that makes a great family pet. These dogs love giving and receiving affection, and maintain a sparkling personality that pleases all owners and guests. Their grand stature is a sight to behold, and they continue to make popular pets for those that have the space to fit them. Though they are best suited for owners with some dog training experience and plenty of time to shower them with attention, these dogs are some of the most loyal around. The first Great Danes were bred for hunting large game by the Germans. Their exact origins remain unclear, but the current breed is known to be a mix of Old English Mastiff with the Irish Wolfhound. Once they were no longer used for hunting, they were raised to be a loyal guard dog, and many of their original hunting instincts were bred out. Great Danes are very friendly, and rarely known to show aggression. They are brave animals but sensitive to harsh punishment. They will be gentle and affectionate to both children and pets, but their size can make their friendliness dangerous to small children, so all playtime with kids should be supervised. They are also very relaxed creatures provided they receive ample exercise. Living Environment – Great Danes are best suited for larger spaces to prevent destruction (both accidental and purposeful). A large yard is beneficial for exercise. Apartment living is possible, but not recommended. They are also sensitive to extreme temperatures. Grooming – They have very short hair and require very minimal grooming. Their coats could benefit from the occasional grooming to remove any stuck hairs, especially during shedding season. They do shed for long periods of time, with some shedding year round. Diet & Exercise – Great Danes require a lot of exercise. They have a lot of energy and their weight can make them predisposed to dog health problems when not properly exercised. The exercise will also keep them from boredom behaviors which can be extremely destructive with these breeds. Luckily they are large enough that they can easily keep up on jogs and bike rides, and are enjoyable companions on long walks. Their metabolism is quite slow, so their food/pound ratio is less than many other breeds, but they do require a great deal of food. Measuring is vital to ensure your dog does not gain weight. 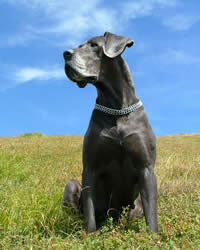 Health – The majority of the Great Dane’s health problems are due to their large size. Bloat is rare but a risk, and many owners get their dog’s stomachs tacked in order to reduce this risk. Obesity is also common and can contribute to their short life span. They are also prone to heart diseases such as Dilated Cardiomyopathy, as well as various genetic disorders such as blindness, deafness, bone cancer and cataracts. At a young age, Great Danes are much easier to train. That is why the majority of their training should come during their puppy years, and their owner should possess at least some dog training expertise. Before their large size makes them more dangerous, these dogs should receive basic obedience training. They should also be well socialized, taught not to lean on people and trained to stay off furniture. Once they become adults, they are notoriously difficult to train.